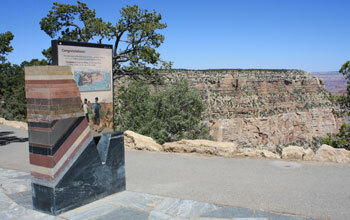 The Trail of Time at the Grand Canyon is a unique, new approach to informal geoscience education. Understanding the Earth (the science of geology) is more important than ever as human societies flourish on our planet of limited resources. Education and research on the cognition of deep time, Earth's record of climate and environmental change, natural resources and the interactions of humans in the Earth system are urgent topics for both formal and informal science education and public science literacy. The National Park Service, a premier national resource for public science education, with support from the National Science Foundation, hosts this exhibition that highlights and promotes new approaches in effective geoscience education and interpretation. Further information is available at http://tot.unm.edu/.